Naturally, as a bona fide member of the Skeptics' Society and advocate of evidence-based medicine (and because I was unable to show up at this event myself due to preexisting obligations), I felt obligated to write to try to set the director of this company straight. Fortunately, I wasn’t the only one, and a flood of letters and e-mails convinced the company to cancel the talk. It was over. Score a small victory for reason and evidence-based medicine. Or so I thought. About a week ago, I learned that the chelationist is almost certainly going to have his revenge. That's when another flier arrived in my mailbox at work. It looked very much like the one I had received before and is reproduced below (with addresses, phone numbers, and names obscured, of course). It makes me wonder if the company gave this guy a non-refundable deposit and are trying to get something out of him. Or maybe he's a buddy of someone on the board of directors of the company. Why else, having hurt its own reputation in the local medical community by inviting this guy and sending out advertisements to all the doctors in the area in the first place, would the extended care facility risk compounding the damage to its reputation by re-inviting him? Never mind that this guy offers a veritable cornucopia of unsupported therapies, as described on his own website, including "Intravenous Chelation Therapy, Vitamin C Intravenous Therapy, Hydrogen Peroxide Intravenous Therapy, Mercury Detoxification via DMPS injections and Colon Hydrotherapy," among others, all of which are well-debunked on Quackwatch. Regular readers may recall that I ranted a bit last time about the somewhat weasely letter I got from a company flack apologizing but excusing the invitation with a line about how his company's goal is to "educate, never endorse." A few commented that I was being too harsh on the guy, and I was been beginning to wonder if perhaps I had indeed been too harsh. Now that the company has invited Dr. "GHL" back, despite the fact that they now know that he is an advocate of unproven and scientifically unsupported "therapies" (like chelation therapy for cardiovascular disease or colonic irrigation for other maladies), I now contend that I wasn't harsh enough. Notice, though, how Dr. GHL is much cleverer this time. He's clearly learned from his first experience. I have a sneaking hunch that he probably didn't know that his first flier would be mailed to physicians. It was clearly designed for the lay public, most of whom don't have the medical knowledge or background to understand why his claims for chelation therapy were so obviously overblown. This time, he knew. The claims listed on this new flier are much less specific and much more innocuous-sounding. However, they are still very much of a kind to the claims alties like to make. "Strengthen the immune system"? Gee, who wouldn't want to strengthen his or her immune system? (The contrarian in me can't help mentioning people autoimmune disorders here.) "Slow the aging process"? Who wouldn't want that as well? (Who knows what that means, though.) What about environmental pollutants or toxins? Of course they must be bad! (Of course, alties rarely tell you which toxins are at fault or show you clear epidemiologic, biochemical, or phsyiological evidence that they are at fault. It's always some general vague "toxicity.") This guy should go on Bill Maher's show, for cryin' out loud! Sadly, the company also got a representative of the local chapter of the American Cancer Society to appear with our altie. Whether this is just another example of a misguided attempt to provide "balance" or whether it's an attempt to cover its behind, I don't know, but I have to wonder if the invited ACS representative is even aware of Dr. GHL's advocacy of dubious therapies like chelation for cardiovascular disease or colonic irrigation. Questionable or bogus cancer therapies are a huge problem, and the ACS has in general wisely tried to maintain a balance between not unduly discouraging the use of complementary therapies that might be helpful, particularly in improving quality of life, but still protecting the patient from quack "cures" of the sort Hulda Clark pushes. I wrote to you a while back to express my concern about a flyer I received for an event to be hosted at your facility. In my e-mail, I voiced my concerns over the topic of the talk, namely chelation therapy. The flyer contained some highly exaggerated and simply incorrect claims for the supposed benefits of chelation therapy. Presumably, the speaker, Dr. GHL, was planning on touting these dubious benefits in his talk (benefits for which there is no good scientific evidence). As a strong advocate of evidence-based medicine, I pointed out that there is no good scientific evidence or evidence from randomized clinical trials that chelation therapy does any better than placebo. Your company wisely canceled Dr. GHL's talk on chelation therapy after a number of physicians wrote or called to complain before I got around to doing so. Unfortunately, you appear to have rescheduled Dr. GHL with a different topic. 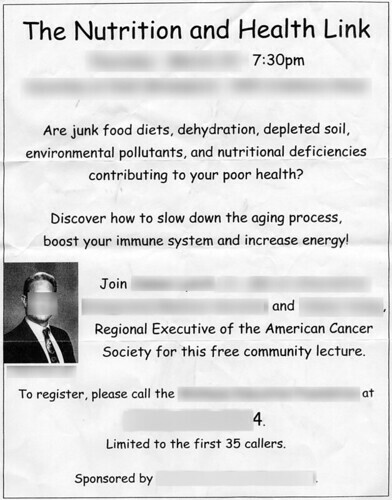 A few days ago I received another flier advertising a talk by Dr. GHL entitled "The Nutrition and Health Link." Putting aside for the moment that Dr. GHL just got burned for openly touting unproven benefits of chelation therapy for cardiovascular disease, Alzheimer's, and a number of other diseases for which there is no evidence of its efficacy (it is also a therapy that he himself administers, as described on his practice's own website), this new flier still manages to raise my concern again, to the point where I feel I must write again. It would appear that Dr. GHL has learned from the previous incident. He is not making claims as easily debunked as the ones he made for chelation therapy. Instead, he has restrained himself. Dr. GHL's claims are now harder to debunk, not because they are more any more founded in science than his claims about chelation therapy were, but rather because they are so vague and undefined. What, precisely, does "boosting the immune system" mean? Will he tell his audience specifically which functions of the immune system is boosted by his methods and how? Is it T cell-mediated immunity or antibody-mediated immunity, and what peer-reviewed scientific studies support his position? Exactly what does he mean by "slow down the aging process"? All of these are buzzwords often used by purveyors of unproven therapies, and none of them appear to have any defined meaning. Indeed, "boosting the immune system" is not unlike the "improving the vital force" that is so commonly used in various alternative medicine claims. Also, he seems to subscribe to the "toxicity" concept of disease. Unfortunately, rarely do alternative medicine advocates define exactly what these "toxins" are that are supposedly making us sick. The only thing he appears to be saying that is hard to argue with is that a bad diet can hurt your health. I am also disappointed to see that Mr. X, the Regional Executive of the American Cancer Society, will be participating in this talk as well. I have to wonder if Mr. X was aware of Dr. GHL's advocacy of an unproven therapy like chelation therapy when he agreed to appear with him. Certainly, the use of unproven and ineffective "alternative" cancer therapies are a big problem, one I would think that the American Cancer Society would not want to support. I am therefore sorry to see Mr. X lending the prestige of the American Cancer Society to this event. Given that Dr. GHL himself offers a veritable cornucopia of unproven "alternative" therapies, including (quoted from his entry on his company's own website): "Intravenous Chelation Therapy, Vitamin C Intravenous Therapy, Hydrogen Peroxide Intravenous Therapy, Mercury Detoxification via DMPS injections and Colon Hydrotherapy," among others, I find his repeat invitation by your company even more disturbing. All of these are debunked quite well on Quackwatch.org and other sites I can suggest to you, if you are so interested. Be assured that I do not have any objections in principle to combining alternative and complementary medicine with conventional medicine, as Dr. GHL appears to advocate. Such a combination may indeed ultimately be shown to improve patient care. However, as an advocate for evidence-based medicine, I cannot support combining specific alternative and complementary medical techniques that are scientifically unproven, some of which may be potentially dangerous (like chelation therapy, which can cause cardiac arrhythmias, or colon irrigation, which can cause dangerous electrolyte imbalances), and sending any of my patients to such an institution would make me uncomfortable. I have little doubt that Dr. GHL is probably a competent physician when confining himself to conventional medicine and most likely sincerely believes that the "alternative" methods he is combining with his conventional medical practice benefit his patients. Unfortunately the hard evidence available at this time does not support such a belief, at least not with respect to the "alternative" medical therapies of chelation therapy, colonic irrigation, intravenous vitamin therapy, or intravenous hydrogen peroxide therapy. I hope that your company is more careful in the future in picking its speakers for public education events and more careful still in issuing repeat invitations. I'll report back on the response (if any) I receive. I'm guessing I probably won't get a response this time. I take back my previous partial defence of this institution. In yesterday's mail, I got two invitations. One came adressed to me, a lupus patient at yada yada yada in anytown USA ... the other came addressed to resident at same address. the supplements/treatments (identical) offered to the lupus pateint would help to BALANCE the immune system, and were being offered at 10, 12, lunch break at 1 and another session at 4. And were in room B on floor 2. Most people just want to feel better, and they'll try anything. With the news about prescriptions medicines like Vioxx, Celebrex it is no surprise that people want to try alternatives. Every commercial I hear on TV or radio for drugs these days has a laundry list of side effects that mostly sound worse than the disease. Every era has its charlatans and quacks, and they prey on the gullible, but what's even worse is that they target those already made vulnerable by illness. There is no excuse for empty promises, or worse, for those promises that actually end up doing more harm. The poor patient just wants some relief. People eat this crap up. It's so irresponsible of the center to allow someone like him to come and mislead people. It will certainly "Maher" their reputation (har har... ok, sorry, that was bad). If you could go, and then post video of you actually heckling and derailing the speaker, I think you'd be my favorite blogger. I don't know if heckling would be necessary. In fact, politeness is far more effective. All that would be necessary would be to get up at the question and answer session and calmly ask science-based questions and ask him to provide references to clinical trials in peer-reviewed journals that support his assertions. That drives 'em crazy. I'd think communication to the local and State ACS chapters would also be major effective steps here. Obviously this fellow and some administrator at the institution in question either go to Rotary, play golf or own the same time-share. Don't expect the problem to go away. It would be interesting to know the kind of thought processes people go thru to come up with "therapies" like injecting hydrogen peroxide into people. I loathe these money-sucking uhh . . .persons. My wife has a recurrant stage 4B thymoma and we've been fighting off these people for 4 years. We live in Saudi where good medical care is available but unfortunately pseudoscience is also very common. Cancer "cures" around here range from "holy" water (from the zam zam wells) to strange plants, to (no kidding) bleeding or "cupping." Everyone and their dog has popped up with something "that cured my aunt Jameela of something that might possibly be a little bit like a thymoma." etc. etc. Scammers that fleece healthy people or those just suffering from hypochondria don't bother me excessively but most don't. They go after people suffering from cancer and other terminal diseases. As far as I'm concerned you weren't harsh at all to the poor boy. Of course I'd probably cheer at assault and battery as well.